There’s a fine line between splitter blues skies and afternoon thunderstorms in the mountains. 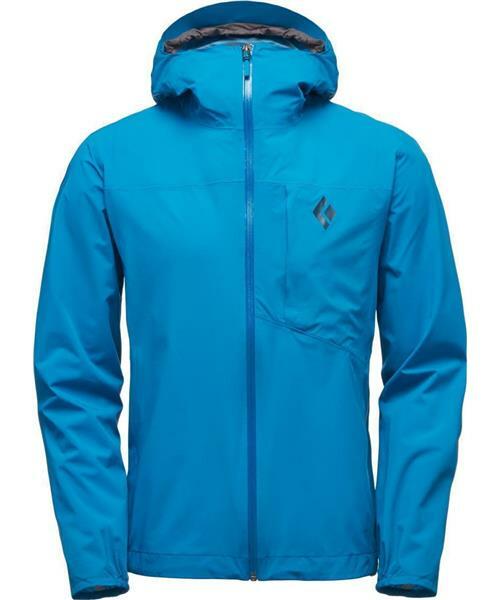 That’s why Black Diamond designed this streamlined, stretch rain shell. Whether you’re enjoying a rainy trail run or bailing from a peak during a monsoon, the FineLine Stretch Rain Shell—featuring their BD.dry™ waterproof/breathable/windproof solution—is engineered to shield you from whatever the weather holds. Optimized for mobility, the FineLine has underarm gussets and a stretch fabric, which increases the shell’s comfort and durability during fast and light climbing missions. Featuring an adjustable, climbing-helmet-compatible hood and a waterproof center front zipper to keep out unwanted moisture, the FineLine packs into its own chest pocket. Clip it to your harness with the carabiner clip loop and rest assured that if the skies crack open, you’ll stay dry.